Jason Louis Motte (born June 22, 1982) is an American professional baseball relief pitcher for the Colorado Rockies of Major League Baseball (MLB). He previously played in MLB for the St. Louis Cardinals and Chicago Cubs. The Cardinals drafted him as a catcher in 2003 and he converted to pitching in 2006. Motte played a key role in the 2011 World Series championship run, saving five postseason games. In 2012, he led the National League (NL) in saves with 42. Motte had surgery to repair an ulnar collateral ligament injury that kept him from playing all of 2013. After returning to the Cardinals midway through the 2014 season, Motte signed a one-year, $4.5 million deal with the Cubs for 2015. Motte was born in Port Huron, Michigan, but attended Valley Central High School, Montgomery, New York, in 2000 where he played catcher. Valley Central is also the alma matter of former MLB pitcher Matt Morris. He then attended Iona College in New Rochelle, New York. At Iona, Motte could throw to second base from behind the plate as fast as 1.76 seconds, and was clocked at throwing 85 mph from this position. While Motte never pitched for Iona, the school's pitching coach reported that, with shinguards on, Motte once released a 94 mph pitch from the mound at practice. Cardinals selected Motte in the 19th round of the 2003 Major League Baseball draft as a catcher. Early in his minor league career, he struggled as a hitter. He batted .222 in 2003, .175 in 2004, and .176 in 2005. On June 29, 2005, Motte went on the disabled list (DL) for a thumb fracture while playing for the High-A Palm Beach Cardinals. Entering the 2006 season, Motte had compiled a .188 career batting average. He also had just 21 walks, 13 doubles and four home runs in 209 minor league games as a catcher. However, his arm strength and accuracy were difficult to ignore. Motte threw out 53 of 109 would-be base stealers for a 49% rate. He also recorded 160 assists in his first 181 games. Spurred by the thumb injury, declining batting average and conspicuous throwing abilities, Motte converted to pitching. The results as a pitcher showed much more promise than attempting to become a Major League hitter. Between State College and Quad Cities in 2006, Motte pitched his first 39 professional innings (IP). He struck out 38 (SO) and posted a 3.69 earned run average (ERA) while allowing 10.6 hits per nine innings pitched (H/9). The next season, he improved across the board. Between Palm Beach and Springfield, he totaled 59 IP, 69 SO, a 1.98 ERA and 6.6 H/9. That performance made him one of the Cardinals' top pitching prospects and the Cardinals added him to their 40-man roster in early December 2007 to avoid exposing him to the Rule 5 draft. 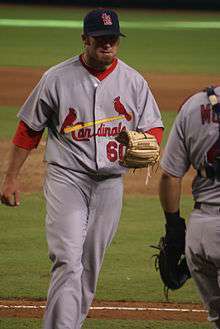 Motte spent the majority of the 2008 season with the Memphis Redbirds, the St. Louis Cardinals' Triple-A farm team in the Pacific Coast League. His abilities as strikeout pitcher became even more prominent: in 66 2⁄3 IP, he struck out 110, a rate of 14.8 strikeouts per nine innings pitched. The Cardinals called Motte from the minor leagues on September 2, 2008. He recorded a total of 12 appearances, all in relief, with an ERA of 0.82 in his first month in the big leagues. In 11 IP, Motte struck out 16 batters, allowing three walks and five hits. He earned his first save on September 18 against Cincinnati in their ballpark, getting the final out in the ninth inning with a fly ball to left field. Jason during the 2011 World Series Parade. During the 2009 spring training camp, Motte competed with Ryan Franklin and Chris Perez in an attempt to earn the role as the Cardinals' 2009 closer; manager Tony La Russa later said he would not establish a closer. Instead, he would use a mix of relievers in the ninth inning. Motte was called on to save the first game. However, he gave up four runs to the Pittsburgh Pirates in the ninth inning. Pittsburgh won 6–4. After this blown save opportunity, La Russa moved Motte into a middle reliever role. Despite the blown the save on opening day and occasional rough outings that contributed to a 4.59 ERA, Motte recorded 14 holds. Motte became the Cardinals' de facto closer late in the 2011 season – La Russa still had not named him as the closer – helping his team win the Wild Card. Motte pitched in two games against the Philadelphia Phillies in the 2011 National League Division Series (NLDS), in which the Cardinals won the series 3 games to 2. Motte also pitched in three games in the 2011 National League Championship Series (NLCS) against St. Louis' division rival, the MIlwaukee Brewers. The Cardinals won this series in six games. Motte was on the mound for the final out of the NLCS winning the Cardinals their 18th pennant. He was also on the mound when the Cardinals defeated the Texas Rangers in the World Series. He won the NL Player of the Week Award for the first time for his week of September 17–23, after picking up his fifth consecutive save out of five opportunities and league-leading 40th. Motte finished the season with a National League leading 42 saves, one of only four pitchers in Cardinals history to reach the 40 or more saves. On January 22, 2013, the St. Louis Cardinals announced they had reached a two-year contract with Motte, the financial details of which were not disclosed. The deal effectively bought out the final two years of Motte's arbitration eligibility. At the end of the contract he will be a free agent. Motte earned $1.95 million in 2012 and had filed for a salary of $5.5 million for 2013. The Cardinals counter-offer was reported as $4.5 million. On March 29, 2013, the Cardinals placed Motte on the DL with a strained elbow. He and the team physician at first hoped that non-surgical rehab treatment could allow him to still pitch at some point in 2013. However, seeing little –if any – improvement, the Cardinals announced on May 3 Motte would undergo season-ending Tommy John surgery to repair a torn ligament in his elbow. Manager Mike Matheny called upon Edward Mujica to replace Motte as closer. Eventually, rookie Trevor Rosenthal replaced Mujica by season's end and saved four games in the Cardinals' NL pennant-winning playoffs. Like Adam Wainwright and Chris Carpenter before him – both of whom also rehabilitated through Tommy John surgery – Motte made himself available for the Cardinals relievers during games, especially for the rookies and inexperienced relievers. After the World Series, with Motte still recovering and Rosenthal's convincing finish as closer, Matheny announced Rosenthal would be the closer for 2014. Meanwhile, Motte continued to progress and was throwing off a mound by November. Due to Motte availing himself to the other Cardinals pitchers even while he was unable to pitch, his teammates voted for him to receive the Darryl Kile Good Guy Award. He is the first player to receive the award while not making a single game appearance in the season for which he was awarded. On May 21, Motte made his long awaited return to the mound after missing 2013 due to Tommy John surgery, pitching 1 and 1/3 inning of scoreless relief. However, he struggled for the rest of the season and was ultimately left off the Cardinals' postseason roster. He became a free agent after they were eliminated by the San Francisco Giants. On December 16, Motte and the Chicago Cubs agreed to a 1-year, $4.5 million contract. On December 8, 2015, Motte signed a two-year, $10 million contract with the Colorado Rockies. Motte's primary pitch is a four-seam fastball, which was clocked in the upper 90s during 2008. In 2012, it was clocked at 98 miles per hour (MPH). He also threw a cut fastball that reached 93 MPH and a sinking fastball that reached 96 MPH, and, rarely, an 85-MPH changeup. His cutter has shown among the widest variance of movement of all his pitches, to being anywhere from flat vertically to moving up to eight inches. He also regularly threw a curveball through the 2010 season, but has discontinued it since last throwing it in 2011. Motte is married to Caitlin Motte. The couple run two foundations, the Jason Motte Foundation, and a cancer awareness foundation called "Strikeout Childhood Cancer." 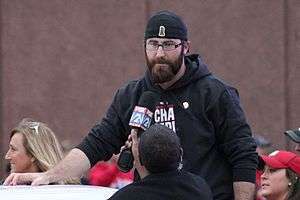 While recovering from Tommy John surgery in 2013, Motte disclosed that his encounters with numerous people stricken with cancer – from his grandfather to Cardinals fans, including many children – moved him to visit and encourage them. As a result, Motte and the Cardinals organized a pediatric cancer awareness day on September 23, 2013, to set aside 5,000 game tickets at the pavilion that cost $10.00 each, with $3.00 per ticket going to the Jason Motte Foundation. An additional 1,000 tickets were donated to pediatric cancer patients just released from the hospital. For those unable to go to Busch Stadium, Motte organized a group of several of his teammates to see the children in person. ↑ Leach, Matthew (February 25, 2008). "St. Louis Cardinals news article on the status of Motte". stlouis.cardinals.mlb.com. Retrieved October 10, 2011. 1 2 3 "Jason Motte minor league statistics & history". Baseball-Reference.com. Retrieved September 22, 2013. 1 2 "Jason Motte profile". stlcardinals.scout.com. Retrieved September 22, 2013. ↑ Leach, Matthew (September 18, 2008). "Cards paint the town Red in finale: Motte mops up first big league save; Pujols drills big blast". MLB.com. Retrieved October 10, 2011. ↑ Meisel, Zack (September 24, 2012). "Motte named NL Player of the Week for first time". stlouis.cardinals.mlb.com. Retrieved September 28, 2012. 1 2 3 4 Langosch, Jenifer (January 22, 2013). "Motte, Cardinals reach two year agreement". MLB.com via St. Louis Cardinals official team website. Retrieved January 23, 2013. ↑ DiGiovanni, Joe (May 3, 2013). "Cardinals' closer Jason Motte will have season-ending Tommy John surgery". MLB.com. Retrieved January 3, 2014. ↑ "Trevor Rosenthal statistics and history". Baseball-Reference.com. Retrieved January 3, 2014. ↑ Goold, Derrick (January 1, 2014). "Motte continues comeback". St. Louis Post-Dispatch. Retrieved January 3, 2014. ↑ Todd, Jeff (December 8, 2015). "Rockies sign Jason Motte". MLBTradeRumors. Retrieved December 8, 2015. ↑ "Player card: Jason Motte". brooksbaseball.net. Retrieved September 22, 2013. ↑ "Player card: Jason Motte's pitch types, velo and movement". brooksbaseball.net. Retrieved September 22, 2013. ↑ Goold, Derrick (September 22, 2013). "Motte is on a mission". St. Louis Post-Dispatch.